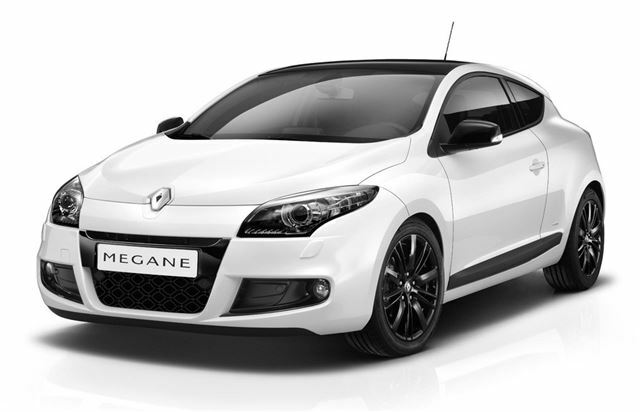 Renault has launched a Monaco GP limited edition version of the Megane Coupe which is set to go on sale in April 2011. Based on the Dynamique TomTom specification, the special edition model will be unveiled at the Geneva motor show in March. It gets pearlescent Arctic White paint, along with gloss black body trim on the door mirrors, rear diffuser and foglight surrounds plus black headlight masks and "Monaco GP" badging. Inside there are Arctic white cabin details (console, dashboard trim, door handles), plus exclusive "Monaco GP" stitching on the seats, a numbered plaque and "Monaco GP" floor mats. Two engines are available - the 1.9 dCi 130bhp emits just 135g/km of CO2, while the TCe 130 benefits from the latest advances in downsizing, enabling a 1.4-litre powerplant to boast the torque of a two-litre and the power of a 1.8-litre. Meanwhile, following the success of Laguna Coupe Monaco GP limited edition, a new version is being launched in the spring. Two diesel engines will be available in the UK - the 2.0 dCi 150 and 2.0 dCi 180, the latter with 4Control four-wheel steering for even sharper handling. It will retain the exclusive pearlescent Arctic white. Standard equipment includes 18-inch ‘Interlagos' Chrome Shadow alloys, unique carbon grey Monaco GP cloth upholstery with Monaco GP logo, rear parking sensors, carminat TomTom Live satellite navigation system, 4Control four-wheel steering, Bose Sound System with 10 speakers, single CD with MP3, Bluetooth connectivity and digital amplifier, hands-free card, electric folding door mirrors plus optional leather seats with Monaco GP stitching.